One of the perks of being a children’s writer is that you get to go back and read all the books you didn’t get around to as a child. Patricia MacLachlan’s beautiful, sparse novel Sarah, Plain and Tall came out in 1985, just a little bit too late for me. I discovered it a few months ago, when I borrowed a copy from the local library for research. I borrowed it for research, but I loved it so much that I bought my own copy. Now I’m reading it to my daughter at bedtime. And I can see that, much as I loved the book, I was reading it wrong. I read it with a grown-up’s eyes. My Sarah is hearing it as a child. For her, it’s a completely different book. And I’m learning from that. She loves the characters, just as I did. But we have completely different takes on Caleb, the younger brother of narrator Anna. Anna’s mother died when Caleb was born. 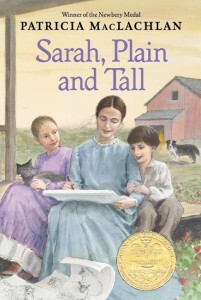 She, Caleb and Papa live alone on their prairie farm until Papa puts an ad in the paper looking for a wife. Sarah, who lives in Maine and has grown up by the ocean, answers. The great question of the book is whether Sarah will stay. The family loves her, and she seems to love them, but perceptive Anna can see that Sarah misses the ocean. I guess when I read Caleb’s words, I’m seeing them through a lens of experience… there’s something bittersweet about looking for promises that aren’t stated, because as grown-ups, we know that doesn’t always work out well. I’m worried for Caleb. Sarah, at seven, has less experience of that sort of thing. She just thinks it’s funny that Caleb’s repeating himself and insisting on a meaning that doesn’t match the words. And in a way, I’m glad that she doesn’t get it yet. Woolly ragwort in your nose. Not so my daughter. She burst into helpless, body-shaking giggles. Clutched her sides. Wiped tears from her eyes. Made me sing it three times — and anyone who has ever heard me sing knows that such a request is not made lightly. Needless to say, my hope of a soothing bedtime story flew out the window. I managed to get her calmed down and read another chapter. Then, of course, she wanted to hear the song again. She wanted to hold the book herself and look at the words and sing them. More giggles. Absolute joy. You’d think Patricia MacLachlan was the greatest comic writer in the history of jokes. My daughter loves this book now. I’m not sure that she’s seeing the same thing the Newberry Medal people saw in it, when they granted the award on the cover. I’m not sure she’s as taken with the lovely, spare prose as I was. But she wants to know if Sarah will stay. And she wants to hear about Seal the cat. And most of all, I think, she wants to know if Caleb will make up any more funny songs. Is there a lesson in here for writers? I’m afraid to go there, in case it leads to an epidemic of nose jokes. But there’s something to be said, I think, for keeping the reader in mind. For thinking like the reader. For creating characters who are so true to themselves and to their ages that they resonate with a reader… and, maybe, for remembering that nose jokes are funny, and that pure, open joy is a pretty wonderful response to a few typewritten words on paper. Thank you! I have read a few of the other books, but not all. She’s a brilliant writer.